Montblanc introduced this new impeccably designed classical timepiece at SIHH 2013. 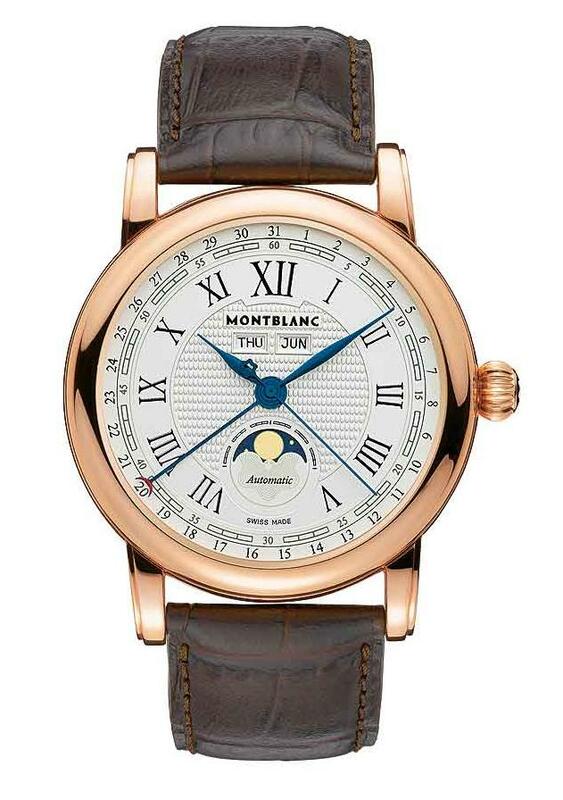 It’s called the Montblanc Star Quantième Complet, and it’s a new addition to its Star Collection of luxury watches. As the name implies (Quantième being French for “calendar”), the watch functions as a “complete” or “full” calendar. This means it’s more versatile than a basic calendar watch which displays only the date but not as complicated (or as costly) as a full-fledged perpetual calendar. The idea behind the watch is to give consumers a choice that falls between the two options. 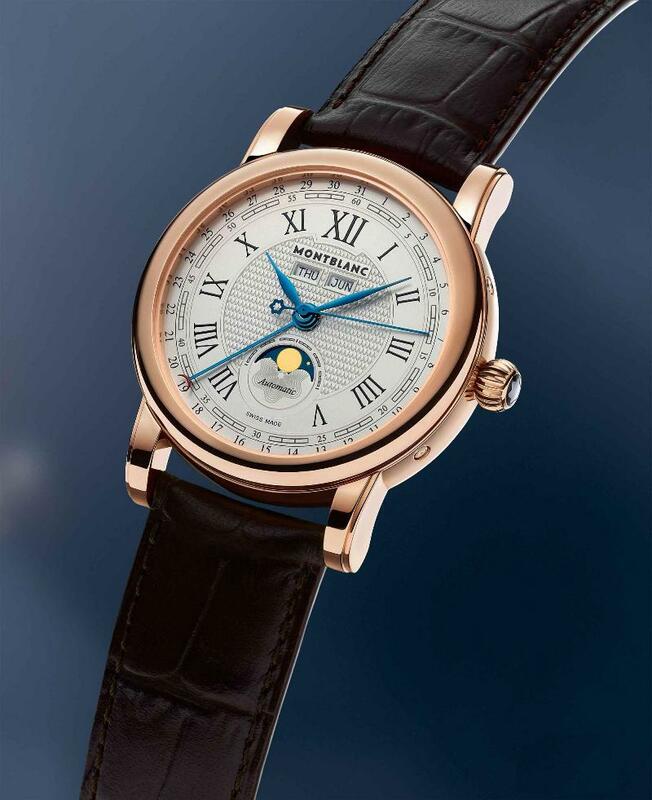 The Montblanc Star Quantième Complet displays the date, day of the week, month and moon-phase in addition to the current time. The date is indicated by a centrally-mounted hand that ends in a red crescent and sweeps along a wreath of 31 digits around the dial’s periphery. 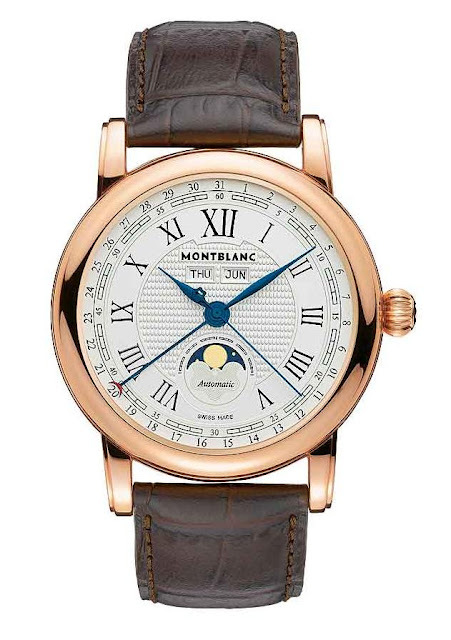 In traditional Montblanc styling, the day of the week and the month are positioned just below 12 o’clock, while the moon-phase display is located in the lower half of the dial, just above the 6 o’clock position. The Montblanc logo is inscribed in black at 12 o’clock, and the dial features crisp black Roman numerals. Between the wreath of hour numerals and the outer ring of 31 days is a 60-minute ring with a segmented numeric scale. Some may object to the use of both Roman and Arabic numerals on the same dial. The baton shaped hour and minute hands are in blued steel while a slender, straight hand with a counterweight, indicates the seconds. The 42-mm watch is in rose gold but will also be available in stainless steel. As one would expect there is a sapphire window in the screwed caseback. This displays the Calibre MB 4810/912, a mechanical movement with a power storage capacity which lasts around 42 hours. The watch can be wound manually via the large onion crown, which is topped by the Montblanc star emblem in mother-of-pearl. Buttons built into the flank of the case are operated by a corrector tool that comes with the watch to set the date, day, month, and moon-phase displays. The watch comes on a brown alligator leather strap with a rose gold buckle. You can't get your hands on one just yet, it will only be available as from August.